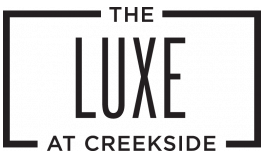 With lushly landscaped grounds, an expansive 6-acre on-site park, and a host of exclusive amenities and services, The Luxe At Creekside is an oasis of tranquility filled with countless social and recreational pleasures. Our world-class amenities include an infinity-edge pool, trellis-covered outdoor kitchen, and a sumptuously appointed Clubhouse for your enjoyment. Whether you are reclining poolside or sipping a freshly brewed Starbucks® latte in the lounge, you'll truly feel as if you live at a resort.